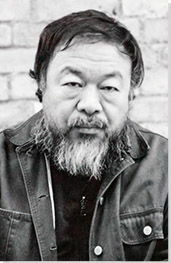 The below artworks are the most important by Ai Weiwei - that both overview the major creative periods, and highlight the greatest achievements by the artist. Artwork description & Analysis: In what first appears to be a classic tourist snapshot, Ai sticks his middle finger up at Tiananmen Square Gate. Also known as the "Gate of Heavenly Peace", and formerly the front entrance to the Forbidden City, this was also the site of the brutal massacre in 1989 in which state soldiers shot peaceful protesters. The Beijiing government still refuses to discuss it, and censors all footage of the event. Artwork description & Analysis: This work compresses a ton of traditional pu'er tea leaves into the space of one cubic meter. Aesthetically, it recalls the glass and steel cubes of Minimalism. Donald Judd and Robert Morris were among the artists Ai admired. At the same time, it is made out of tea (one smells its pungent odor from afar) setting it apart from anything a Minimalist would make. Much tea in China is still produced in compressed cubes, so this is also an enlarged form of an everyday domestic item. While in the West, drinking tea (especially from Chinese porcelain) has historically been a status symbol, tea is the everyday drink in China. The brand here is one of the most common. In a much less dramatic way than Dropping a Han Dynasty Urn, Ai's act of making tea into Minimalist sculpture calls attention to divisions between past and present. Ai's awareness of Western trends and Eastern ideas locates the work at the center of a global matrix crisscrossing the world, a persistent feature of his approach as an artist. Artwork description & Analysis: Both a stylized representation of an earthquake and an image of its effects, Straight is a statement about a specific instance of governmental corruption and negligence. The province of Sichuan suffered massive casualties in an earthquake of 2008, leaving 90,000 dead or missing. Over 5,000 were children killed when poorly constructed schools collapsed on top of them. Ai, a self-taught architect, was outraged to discover that this could have been avoided. Both a memorial and a call to action, Straight is part of the artist's broader effort to hold the Chinese government responsible and urge it to take preventative steps to avoid future disaster. It took him four years to complete this monumental floor sculpture --almost 40 feet long and 20 feet wide - weighing 200 tons. To construct it, he collected the bent and broken steel reinforcement bars that were part of the badly built schools. He commissioned metal workers to straighten and mend them until they looked as they would have before the earthquake. He arranged the bars in waves that resemble the oscillations in an earthquake on a seismograph. The fissures between them resemble fault lines. The thousands of individual components reference the individual lives lost, a typical feature of Ai's symbolism. Artwork description & Analysis: In 2010 Ai filled the enormous Turbine Hall of London's Tate Modern with exactly 100,000,000 porcelain sunflower seeds, each made by a craftsman from the Chinese city of Jingdezhen. Hundreds of individuals had therefore been hired to produce by hand what appeared to have grown from nature. Booths on either side of the exhibition allowed viewers to appear on video and pose questions for Ai, to which he responded on the Tate website. 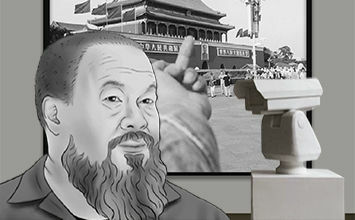 Artwork description & Analysis: In 2010 the Beijing police installed security cameras in his home and studio. These track him from room to room, and even outside. They also closely monitor his posts on Twitter and Instagram, as the artist put it: "In China, I am constantly under surveillance. Even my slightest, most innocuous move can - and often is - censored by Chinese authorities." The artist, in turn, tracks the surveillance cameras, vans, and plain-clothes police officers that monitor his gates. Artwork description & Analysis: "He Xei" means "river crab." In a complex system of homophones designed to evade government detection, it also means "censorship." Thirdly, it sounds like the term for "harmonious," and a well-known Chinese Communist Party slogan prizes the "realization of a harmonious society" - this is often the reason given for limiting access to information.